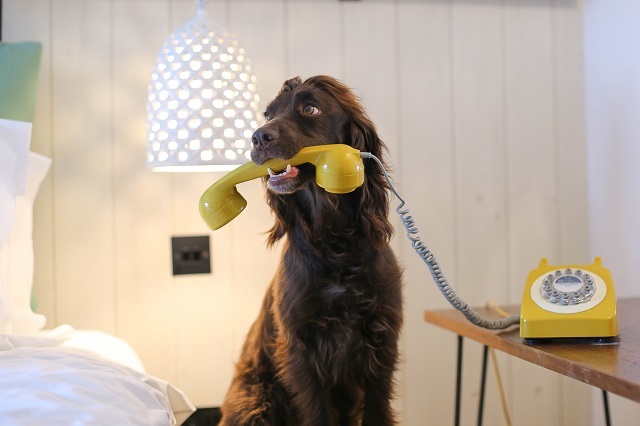 Located in the sweet and pretty Cotswold town of Stow on The Wold, The Old Stocks Inn is the perfect getaway for human and hound. 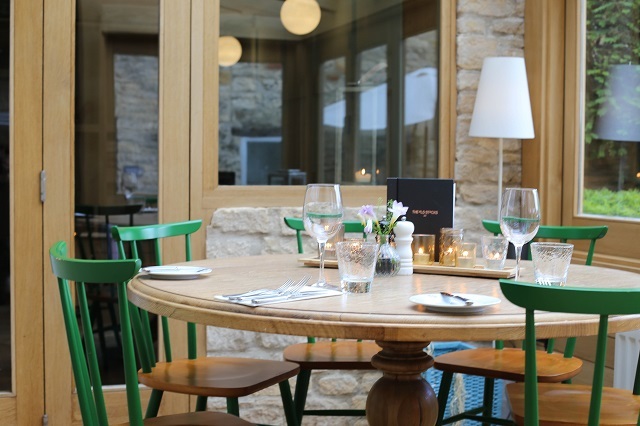 Not only a hotel, but Old Stocks Inn also offers a cafe, restaurant and bar, everything you need whilst exploring the beautiful Cotswold towns. 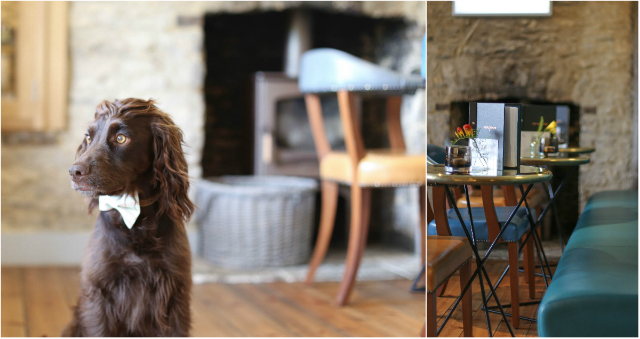 The recently refurbished 17th Century coaching house really stands out with the bright and interesting interior, a boutique hotel that is certainly luxurious but with four paws we still felt very welcomed and at home. 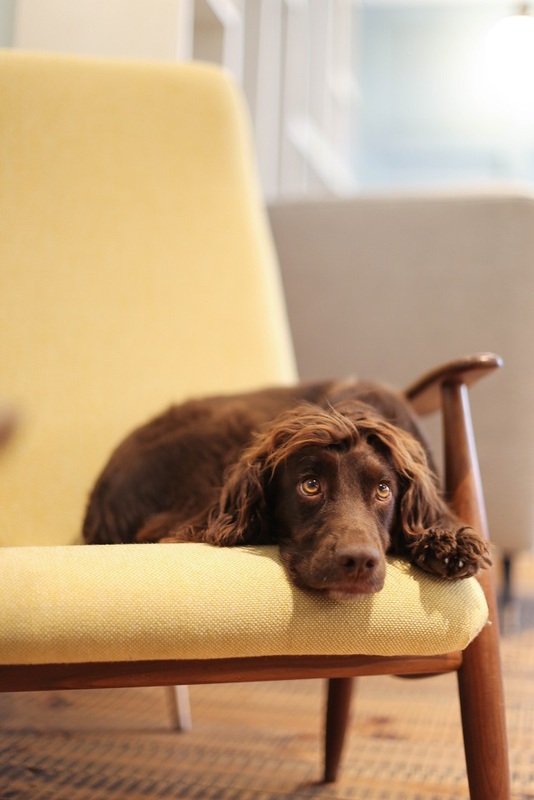 With dogs being welcomed in all areas of the hotel, expect for the restaurant, it was Sev and Lily's dream with treats and fusses from the very start. 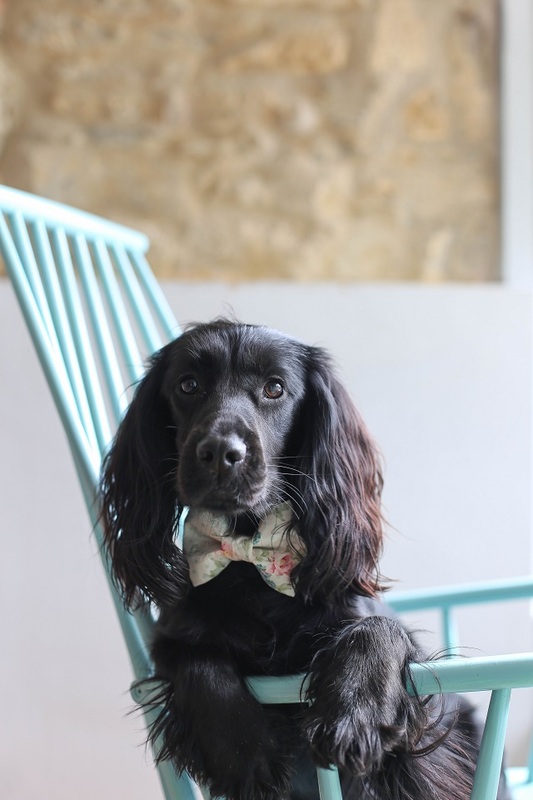 The staff here were truly understanding of two spaniels, and to date it has been the most welcoming in terms of the treatment, interest and care that they received. 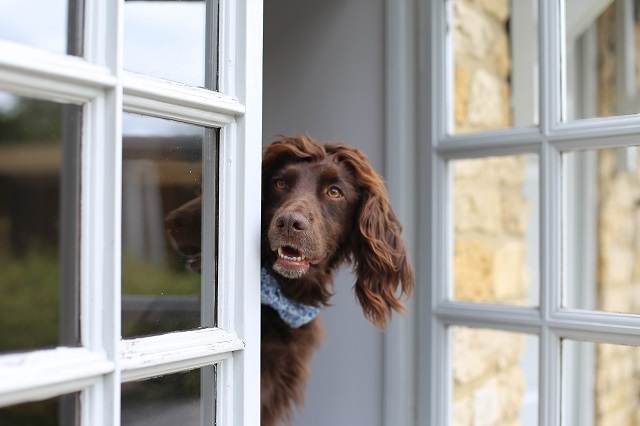 The Old Stocks Inn welcomes dogs in their Garden Rooms, located off the garden and with access to a hose, these rooms are perfect for any muddy pooch after a days exploring the pretty streets or open fields. 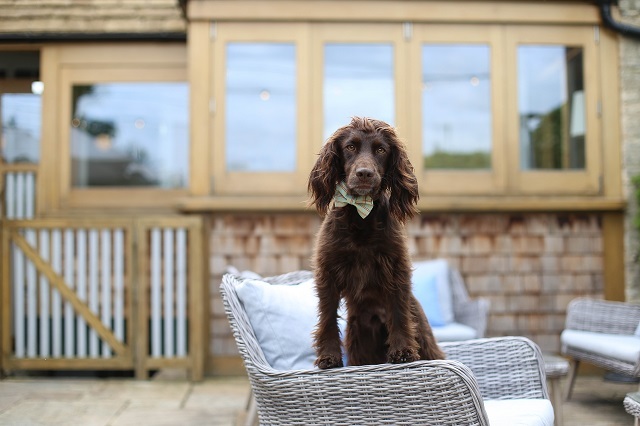 Although compact, the garden rooms have everything we needed for the stay, including a large dog bed, water bowl and even treats. 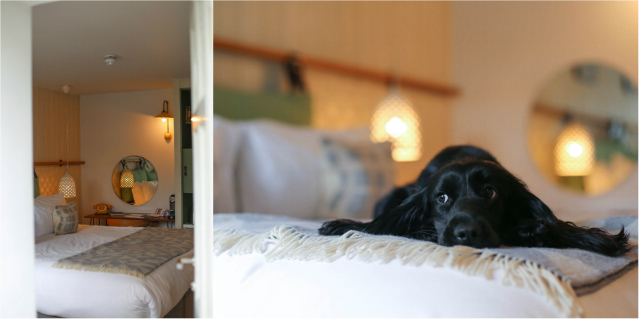 The king size bed was perfect for extra snuggles and the bright and modern interior carried on into the rooms. The garden itself is wonderful, with many different seating areas, heaters and umbrellas, come rain or shine it's a great place to be. The open fire pizza oven is also located outside, which we can't wait to try on the next visit. During the day, The Old Stocks Cafe is open to the side of the inn. 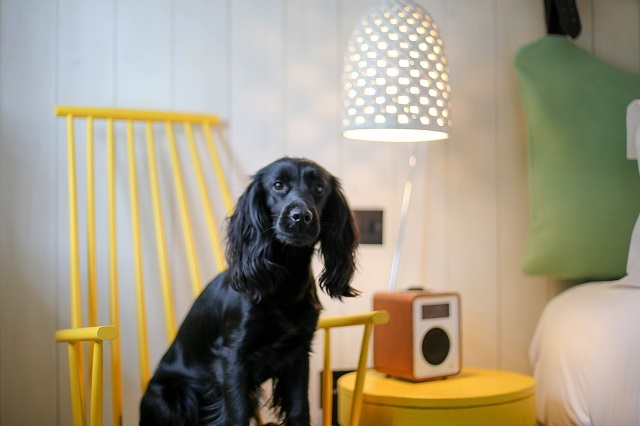 Perfect for cakes and coffee, and dog friendly too. During lunch and dinner hours the restaurant also opens, and although Sev and Lily weren't allowed in the restaurant the other rooms and areas of the hotel were just as wonderful. Starting off our evening enjoying the sunshine in the garden, drinking prosecco while the dogs snoozed at our feet. Later on we were welcomed into the conservatory area, with normal sized table and chairs and a great area for a fur-family, away from everyone to keep the dogs calm and settled. We also ate breakfast here the next morning, such a bright room, and a great space to offer when the restaurant isn't available to you. 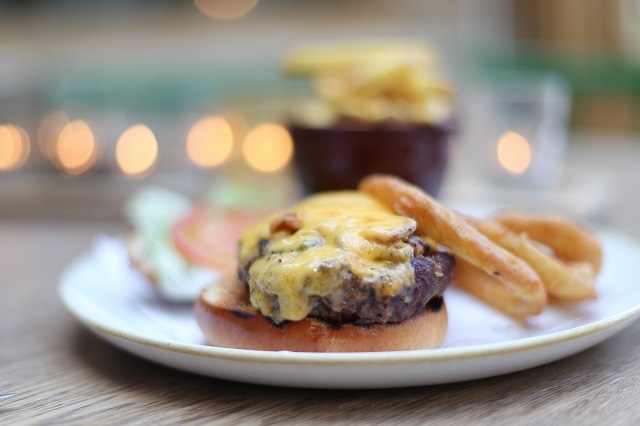 The food at The Old Stocks Inn was wonderful, and we were both so stuffed to even try pudding....although the drinks did keep flowing. 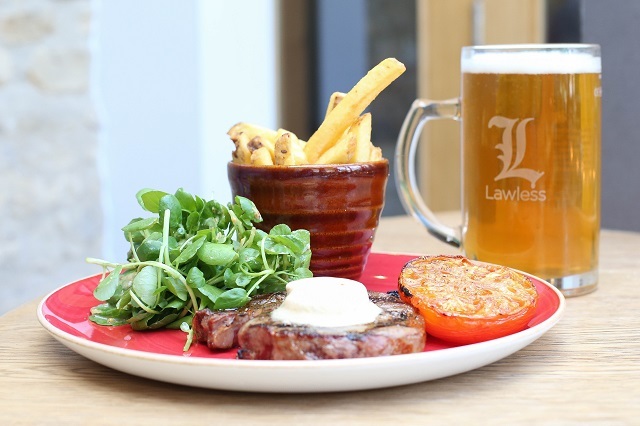 Mains were steak (and beer) for Sam, while I couldn't resist the sound of the burger. We had warmed bread, with far too much butter to start and both finished our meals with wine in the libaray area among the cosy chairs. Breakfast comes with the hotel stay, and really was just as wonderful. 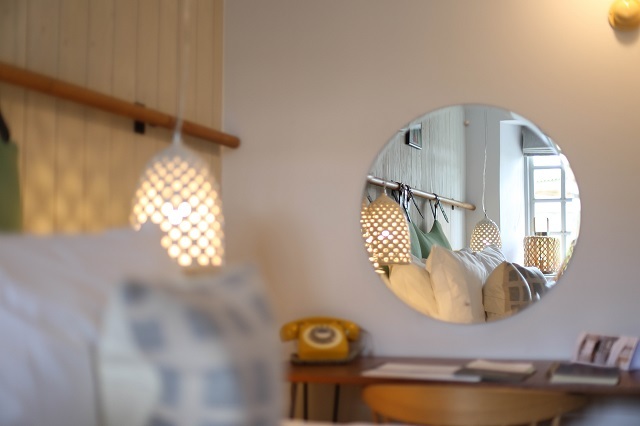 With a buffet of fresh fruit, toast, juices, cheese & ham, which is based in the restaurant. 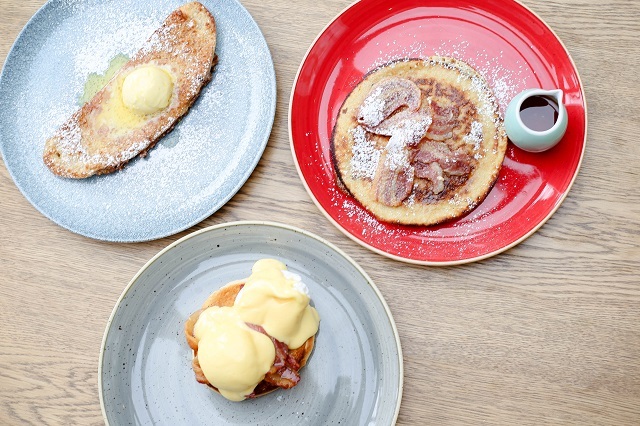 We also got to pick from the breakfast menu, with 3 plates between us, we truly feasted that morning....and oh my! It was good. 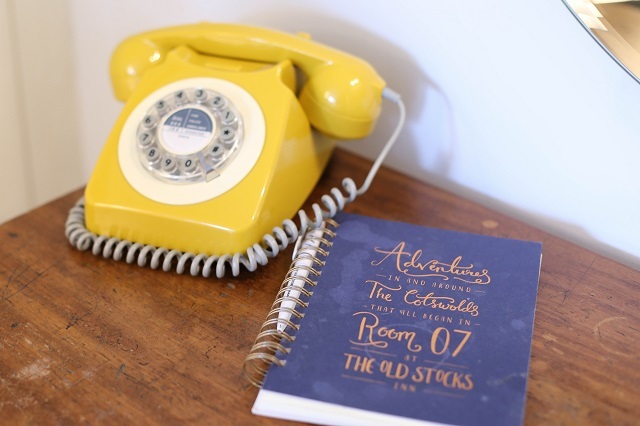 The Old Stocks Inn really is a great base for your Cotswold adventures, with many walks around the area, you can visit near by towns and villages. 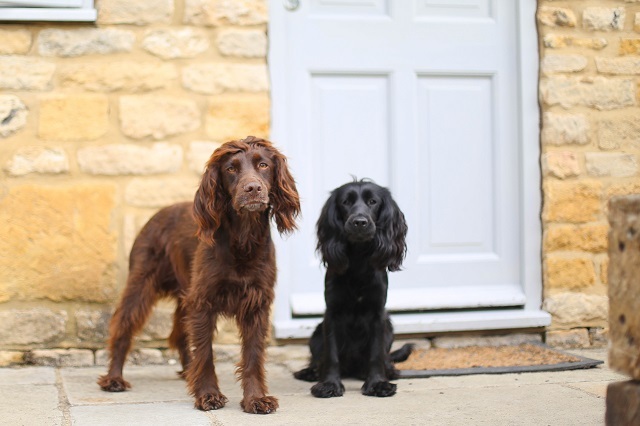 Dog walking maps can be found at reception which is the perfect way to get about and explore more of the picturesque Cotswolds. 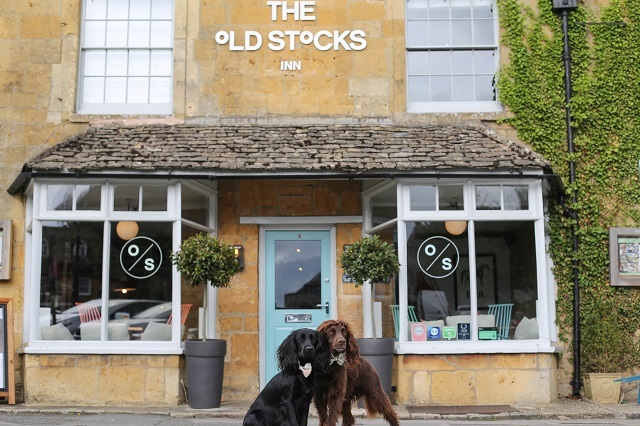 Thank you so much to Old Stocks Inn for having us, we had such a lovely dog friendly getaway.